EDFX is an application that makes installing and customizing graphical FX very fast and easy. 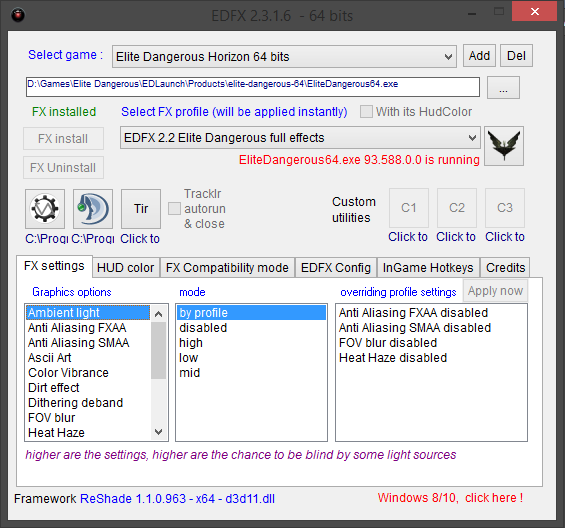 EDFX manages everything you need to utilize features provided by the ReShade Shader Framework. You can use the built-in FX profiles or save your own custom ones. HUD colors can be applied easily just as in FX, custom presets can also be added and incorporated into the EDFX application. Once the application is installed and has located your game's directory, you should be set. It's usually good to try out a few of the default profiles first, then customize their settings in the lower section. FX settings and HUD color are the most useful areas. FX settings lets you select an option on the left, and tweak it's mode. The right side of this panel shows current overrides. I typically disable FOV blur and Heat Haze, as well as any anti-aliasing. This is highly a personal choice and the options available are near-endless. Once you'd like to try out you settings click Apply Now. Note: You can run the game while applying new settings, they should change in-game after a few seconds. Some features such as changing HUD color require restarting the game. 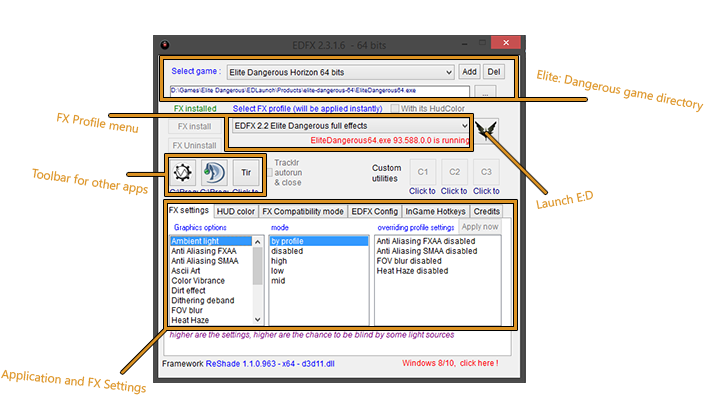 Custom FX Profiles and HUD settings can be saved in the EDFX directory and used within the application. 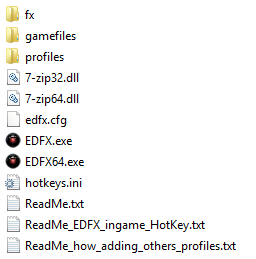 See gamefiles directory for HUD presets and profiles for preset FX profiles. How I live without that in ED, already use some similar in Il-2 Battle of Stalingrad and is amazing.